DENVER — 31 points from DeMar DeRozan and 24 from LaMarcus Aldridge weren't enough, as the Spurs blew a 19-point third quarter lead in Denver. The Nuggets outscored the Silver & Black 39-23 in the final frame. The series will return to the AT&T Center for Game 3, tied 1-1. With the Nuggets in the lead late, who do the Spurs look to? After all, the Silver & Black had a double-digit lead for much of the night. The answer is DeMar DeRozan, of course. Just after this, the Nuggets scored and Spurs coach Gregg Popovich was slapped with a technical foul. The Nuggets took over after that, going on an 8-0 run to claim a 110-101 lead with 2:12 to go. Between 23 points for DeMar DeRozan and 22 points for LaMarcus Aldridge entering the quarter, the Nuggets will key on the Spurs' stars. It will be up to other guys to score some points. Patty Mills and Marco Belinelli got the Silver & Black started in the fourth. But the Nuggets just would not go away. Jamal Murray and LaMarcus Aldridge went back-and-forth for a few possessions in the middle of the fourth, with the Nuggets guard helping his team tie the game. It was tied at 97 with 5 minutes left. After three, the Spurs lead 82-75. Just when you thought it was over, right? The Spurs led 78-59 with 4:28 left in the third. Just 3 minutes of game time later, the lead was down to 6 points, at 80-74. The crowd got back into it after their Nuggets exploded for a 15-2 run. This one is still far from over. In the playoffs, you can't rest after one good half of basketball. The Spurs have plenty of veterans who know this, and they've let the young guys know, too. Derrick White could have settled for a jump shot here, but he got to the rim. That kept the lead in the neighborhood of 10 points. Not comfortable, but it could be a lot worse. The Spurs kept going, eventually growing a 17-point lead thanks to more plays from Derrick White and Rudy Gay. The Spurs led 78-59 before things took a turn in the other direction. At halftime, the Spurs lead 59-49. The Spurs' defense was stifling in the first half, holding the Nuggets to 39 percent shooting (19 of 49). On the offensive end, the stars came to play. DeMar DeRozan and LaMarcus Aldridge scored 17 and 16 points, respectively, on a combined 12-of-25 shooting from the floor. The pair also added 9 points on 11 free throw attempts. One thing to watch in the second half is that both have two fouls, so they'll have to be a bit more careful to avoid serious foul trouble. The good times of the early second quarter didn't last. With the game starting to slip away, the Nuggets went on an 11-0 run to cut the Spurs' lead to 42-34. 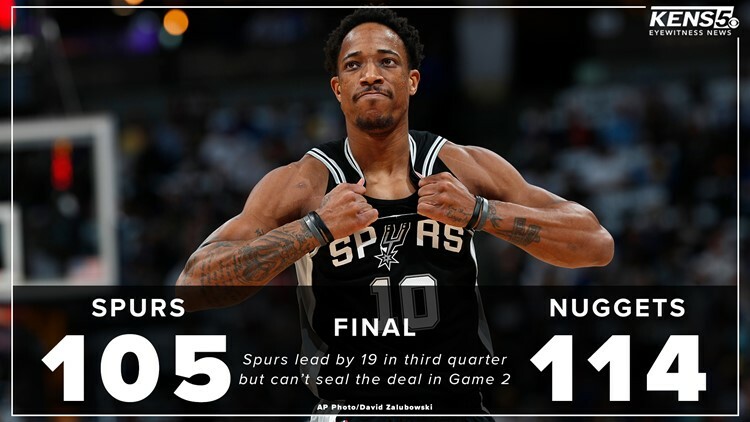 The Spurs were able to right the ship and get the offense going again, mainly because of the continued performance of DeMar DeRozan. DeRozan led the team in scoring, with 17 points, and rebounds, with 7. The United Nations of Ball Movement (that's what #UNBM means, btw) got going not long after a Davis Bertans three-pointer found its mark. The Nuggets just look flustered. The home team's shooting dipped below 30 percent for the game with 8:28 to play in the half. At that point, the Spurs led 41-23 and it was DeMar DeRozan doing the damage. He scored 11 points in the span of less than 4 minutes. After one, the Spurs lead 26-21. The Spurs started to see the ball go through the hoop late in the first quarter. The Silver & Black shot just a hair under 50 percent from the floor, while holding Denver to 32 percent shooting. The Spurs got 12 points from LaMarcus Aldridge, who stepped up while DeMar DeRozan was sidelined with early foul trouble. The shots aren't falling for either team, which isn't a problem yet. The Spurs took a 6-4 lead after the first 4 minutes, but DeMar DeRozan is already in some foul trouble. He picked up two fouls in three minutes and will sit for much of the first quarter. Even when the Spurs aren't shooting the ball well, you know there will be crisp passing. Derrick White committed a couple of first-quarter turnovers, but Denver has been playing tough defense. Marco Belinelli has the potential to be an x-factor in this game and in this series. If he's feeling it, the Spurs offense can reach its full potential by freeing up space. Knocking down this shot is an encouraging sign for a future heat check. There's basically no pressure on the San Antonio Spurs Tuesday night in Denver. If the Silver and Black lose, they go back to San Antonio for Game 3 with the series tied 1-1. That was the goal going into the first round of the playoffs as the 7-seed in the Western Conference. That means all the pressure is on the Denver Nuggets. The number 2 seed dropped the opening game of the playoffs, 101-96, on Saturday night. This is a young team without much playoff experience, but they know they can't go back to San Antonio down 2-0. The Spurs have been a strong team at home, and after Tuesday, three of the next four games in the series will be played at the AT&T Center. The road win for San Antonio on Saturday night was enormous for a team that managed just 16 road wins in 41 tries during the regular season. On the flip side, Denver was a stellar 34-7 on its home court during the regular season. If the Nuggets feel the pressure, they could panic and fall into traps laid by the Spurs' defense. Can the Silver & Black pull of another shocking road win, or will the Nuggets re-assert themselves in the series? Tip-off is slated for 8 p.m. Central.